Acadian Genealogy Homepage; "Tante Blanche"... Marguerite-Blanche Thibodeau Cyr! "Tante Blanche" was heroine of Colonists' black famine. The double jurisdiction, which had presided at the foundation of the Madawaska settlement, did not delay to become a source of conflict between the Province of Quebec and New Brunswick. The Province of Quebec had been the first to exercise its authority in this territory by granting the Lordship of Madouesca at the foot of Lake Temiscouata and by establishing relay stations for the protection of travelers. Moreover, the nationality of the inhabitants gave Quebec a right to protect this territory. But against these presentations, Quebec had written treaties and inter-provincial agreements, which were fixing the boundaries of the Provinces. Since the settlement of the colony, the government of New Brunswick had exercised a continued and uncontested authority. New Brunswick did not delay to rise against the encroachments of Canada in this territory. The government of Fredericton sent its general surveyor, George Sproule, to meet the surveyor of Canada, Samuel Holland, with word to come to a definite understanding regarding the boundaries of the two Provinces. The pretensions of the two representatives were such that it was impossible to come to an understanding on any point. No agreement was reached. Sproule wanted the boundary between Lake Temiscouata and the St. Lawrence River, whereas Holland wanted to include Madawaska in Quebec with the demarcation line at Grand Falls New Brunswick [where I was born] and from there to the Restigouche River. In discussing this business, Lord Dorchester became more anxious for the general interest of Canada than his brother, Thomas Carleton of New Brunswick. In a letter addressed to him shortly after Holland's return to Quebec, he said: "As for the boundaries between the two Provinces of His Majesty, it matters little that the contested area belongs to one or the other Province; but if we consider the possibility that the United States will naturally look upon these boundaries as the beginning of its own frontier, then the matter becomes important." However, the pioneers, having learned that Quebec wanted to include Madawaska within its boundaries, addressed a petition to Governor Carleton in which they made known that they desired to stay with their Acadian brethren under the laws of New Brunswick, adding that communications by the St. John River were easier for the transportation of their products, although importation was from Canada by way of Lake Temiscouata. The petition was signed by 60 heads of families, that is, by two-thirds of the population. This initiative on the part of the inhabitants seems to have changed the attitude of Canada which, for a time at least, became disinterested in the settlement of the boundaries. But the United States was about to enter on the scene and unite the two rival Provinces, for its own common protection. The Treaty of Versailles had designated the St. Croix River as a boundary line between New Brunswick and Maine. The name of St. Croix did not exist any more. The United States took the Magaguadavic for the old St. Croix, whereas New Brunswick maintained that the Schoudic River was the St. Croix, In 1794, a commission was appointed by Great Britain and the United States to study the contested boundary, having discovered on the Schoudic River, the ruins of the Du Monts settlement which identified the St.Croix and at the same time, the boundaries given by the Versailles Treaty. The St. Croix became the uncontested boundary and assumed its historical name. The commission did not go any further. The remaining boundaries became an open field for the ambition of the two unfriendly countries. Despite the disagreements between the governors themselves or with the United States which sometimes troubled the peace of the colony, life in Madawaska was peaceful and went on without any notable events. Canadians and Acadians rubbed elbows in a friendly way. As in the beginning, the men outnumbered the women, so young men of Madawaska went to get a wife in Kamouraska (Quebec). The distinct characteristics between Acadian and Canadian were at the time, more pronounced than at a later date when the fusion of the two, was more complete. The Acadian was more reticent, less understood, and less satisfied than his relation from the St. Lawrence, who would reveal his projects to any stranger within an hour's conversation. The Acadian was more diffident, more cold, and waited until someone came to him. He was more pessimistic than his jovial neighbor and always represented thing unfavorably. But when he had given his word, that word was as binding as any written law of contract. The Canadian who was as frank, was less apt to keep his word once given. However, he had more knowledge and more initiative. The Acadian was equally active, but was more attached to the old methods and customs. Being suspicious, he took offense at the Canadian custom of locking doors when he did not know the padlocks, or any other locks. The Canadian cousin had more order in the administration of his business, as he had in his work. He was more strict in his relations with his neighbor. The Acadian was more negligent in his business which he passed on to others; he was less thrifty, as he relied more on Divine Providence. Gabriel was more skilled in construction work than Jean-Baptiste of Canada who surpassed him in the art of agriculture. Because of these differences, it often happened that Baptiste of Kamouraska would plow the fields of his brother-in-law of Beaubassin, singing or spurring his oxen, while his Acadian relative would construct a barn for Baptiste or level a log in a melancholic and dreamy silence. At this time of isolation all contracts were made orally, so that an oral contract had the force of law. He who broke his contact, lost his word. The court was composed of the pastor and two ancestors chosen by the pleaders. Once the sentence was pronounced, it took effect immediately. All settlements were made at the church door through mediation of a common friend. "The missionary of Madawaska with the assistance of one or two notables of the district, keeps the discipline of the place while settling dissensions, and keeping the peace. He succeeds so well that there are no lawyers, no magistrates, no court." Besides agriculture, the industries at that time, were maple sugar, fur trade and exportation of lumber by water, for the English Marine. Summers were entirely devoted to plowing the fields and clearing acres of woodland for cultivation; in winter, the men spent their time in lumber camps, preparing lumber for the spring drive. The colony exported grain, which they harvested beyond what was needed. The surplus was sold to the colonists and the rest was shipped to Fredericton, where the grain market was always good. Trials, which are the lot of beginning colonies, brought famine to these brave colonists. For two consecutive years, floods and September frost destroyed the entire crop. The year 1797 is known in the 'Annals of Madawaska', as the year of 'Black Famine'. After the last frost in the fall of 1796, the remaining crop was covered by an early snow which brought one of the coldest winters. Many colonists went to the St. Lawrence or to Fredericton, to spend the winter. Those who stayed in the colony, lived on game and herbs. After a long period of waiting and anxiety, when the men had gone hunting and snow had been falling for eight days, the food supply was exhausted. The last portion of boiled barley had been eaten, the last cow had been killed, and the hunters had not returned. At last, one evening, the men came back with a companion who had died of cold and hunger, and another who was dying...but they also brought food; the colony was saved! As soon as her work of mercy became known, "Tante Blanche" was venerated with great respect and devotion by all the colonists. She cured the sick, found lost articles, reconciled enemies. Her reprimands to delinquents and drunkards, were more feared than those of the bishop. Mrs. CYR was truly the aunt of a great number of young families, in Madawaska. Her mother's name was Leblanc and was the daughter of Rene Leblanc, Public Notary of Grand-Pre immortalized by Longfellow. She died in 1810 and, on account of her great devotedness during the famine, she was buried in the church of St. Basile (New Brunswick), a privilege without precedent and accorded to only a few, later on. They called her Aunt Blanche ("Tante Blanche") and she became the "Aunt of Madawaska". In the spring of 1797, the government came to the help of the poor colonists. In July 1794, Madawaska had its first resident pastor, Father Francois Ciquart, a Sulpician. Father Ciquart came to Canada under the regime of Governors Craig and Haldimand, at a time when French priests were forbidden to enter the country. Haldimand found him and had deported to England, from where he passed over to France. He was director of the works of the Sulpicians at Bourges, when the French Revolution broke out, and was sent out of that country in 1792. He came back to America, where Bishop Carroll of Baltimore, confided to him the Abenaki missions of the Penobscot River. It is from there that he came to the St. John Valley. Since Father Ciquart knew the language of the Abenakis, Governor Carleton invited him to minister to the Indians of the St. John Valley. He accepted the invitation and protection of the Governor, after which he went to Quebec to be approved by the Bishop. Bishop Hubert accepted him in his diocese and gave him the parish of St. Basile of Madawaska. The colonists were overjoyed to get a resident pastor. In no time, they built a humble rectory near the church, to house the pastor. Father Ciquart was the father, teacher, doctor, lawyer and judge of the colony. The Malecites were very pleased to a have a missionary who could speak their language. Warriors from Medoctec, Springhill and Tobique, came often to St. Basile to hear Father Ciquart preach. In 1798, Father Ciquart left Madawaska, to tend to the Penobscot missions which were more numerous. He came back to Fredericton and later went to Memramcook, where he stayed till 1812. He passed by Madawaska on his way to Quebec, from where his Bishop sent him to the Indian missions of St. Francois du Lac. He died in Montreal, among his confreres of St. Sulpice in 1824, at the age of 70. After Father Ciquart's departure, St. Basile became a mission ministered by the pastor of St. Andre de Kamouraska. But, the inhabitants of Madawaska wanted a resident pastor. Since French missionaries were forbidden to enter Canada and the Maritime Provinces, the Bishop of Quebec did not have enough priests for a country larger than Europe and in a state of rapid development. Fathers Amyot, Vezina and Dorval visited St. Basile, between 1799 and 1804. When the inhabitants of Madawaska asked Bishop Denaut for a resident pastor, he ordered them to finish the church and rectory and provide the necessary dispensaries. The following year, he sent Father Charles Hott, assistant at River Ouelle, as pastor of St. Basile, and with the help of his parishioners, he set everything right. Despite famine and delays cause by the emigration of a few colonists, the colony had increased in population. The settlement at Grand River was encouragingly increasing. The present parish of St. Anne de Madawaska, where the Martin, CYR, Theriault, Bourgoin, Beaulieu and Sirois families had settled, was rapidly growing. The year 1804, witnessed the arrival of the first pioneers of Cahutauqua. "Where Angels Are Found; The Story of "Tante Blanche"
The desperate plea for government relief was sent; it was their last, best hope. The plight of the Franco-Americans settling the Madawaska Territory (now St. John Valley), began in 1795. Unusual floods had almost totally decimated the harvest. All of the hard work put in that year was gone; drowned, with barely enough salvaged to live through the winter, but survive they did. Hope and a staunch faith in God and their church carried them on. Once more, they bent their backs to the land, plowing, sowing and nurturing. Then, 1796 wrought another blow, early frosts killing part of all the crops...another harvest that yielded scarcely enough for each settler. Even with all these afflictions, it was not until 1797, the Year of the Black Famine, that the families finally had no other choice but to send their plea to the government. That winter was the most trying and desperate. September brought a two inch snowfall that covered their hopes and dreams. The pitifully few remaining crops caused fear and anguish. There had been no chance to build up stores for the past two years. Some of the French-Canadian and Acadian families did return to Quebec, some moved down the St. John River Valley toward Fredericton. However, most chose to remain. After being driven from place to place by war, their only wish was for a home to live in peace. For that, they were willing to endure a terrible ordeal. They could see starvation looming, so a hunting party made ready and departed. No one could be sure when the government supplies of food and clothing would arrive...if at all. Among those who chose to stay was MARGUERITE-BLANCHE THIBODEAU CYR, affectionately called "Tante (Aunt) Blanche" (who was my third cousin, seven times removed). Originally, her parents came from Grand-Pre. She was the granddaughter of Rene Leblanc, the notary of Grand-Pre mentioned in "Evangeline" by H.W. Longfellow. "Tante Blanche" was born in 1735. She was genuinely related (in some way or another) to many neighbors. Her marriage to Joseph CYR in 1760, added to the number of her relations. 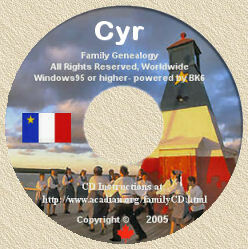 Joseph CYR was a direct descendant of the original families who settled in the area. Most of the descendants of Joseph and "Tante Blanche" still live in the Madawaska - St. Basile area (and some of us, even moved to Guelph, Ontario!). It is in our greatest moments of adversity that we find angels, and "Tante Blanche" was hailed as their very own guardian angel. Her wonderful nature and selfless acts have made her a legend. "Tante Blanche" helped her community to overcome near starvation. Cut off from neighbouring settlements they could only await the return of the hunting party. It was a long, dark tunnel but there was one point of light, "Tante Blanche". As it snowed continuously for eight days she strapped-on snow shoes and trudged almost blindly from house to house. From her own meager stores of food and clothing, she made sure no one went without. Her health and strength brought hope to those who were sick and downhearted. Constantly she must have been asked, "will it ever end"? "Tante Blanche" did not give up. She tirelessly visited all of her family, friends and neighbours (the large families of Thibodeau's, Cyr, Theriault, Ouellette and Violette). She helped to lay out the dead, nurse and care for the ill and to boast the morale of those who had given in to their misfortune. It was an interminable wait, and sadly, when the hunters did arrive home, one had died and another was near death, but they had successfully saved the entire settlement from starvation. One can only guess of their own tribulations on the hunt. The enormity of the task must have weighed heavily upon their shoulders. The endeavours of "Tante Blanche" and the hunters turned out to be of the utmost importance. The government supplies did not arrive until spring. Nevertheless, they were sorely needed and most welcome. Surely all would have perished if not for the courageous efforts of "Tante Blanche" and the hunting party. "Tante Blanche" dedicated all of her life to caring for the sick and poor. She was treated with great reverence by all that had the good fortune to know her. She was often called upon to chase out evil spirits, find lost objects, to reconcile enemies, and she could bring good luck just by wishing it. She softened the hardest souls, reformed blasphemers and even hopeless drunkards by sheer force of character and example. She lived in Madawaska, but it was during the time she lived at Van Buren that she died, March 29, 1810, at 72 years of age. Her capacity for love and charity earned her the privilege of being interred in the chancel at St. Basile, of Madawaska (Yvon's Note: where my wife's first cousin, Father Napoleon Michaud, served as Pastor from July 1984 to August 1995. He died on February 8, 1996. And, in 2011 my wife's nephew, Father Ivan Theriault, was appointed "modérateur/pastor of the parish). This was an honour without precedent rarely bestowed upon laymen anywhere, never before to a woman. Even though the weather in 1797 caused awful suffering, the oral history of "Tante Blanche" survived to inspire courage in others. The 1969 Madawaska Centennial Log Cabin, in St. David, Maine holds most of the artifacts donated to the Madawaska Historical Society. It now officially bears the name "Le Tante Blanche Historic Museum"...thereby assuring her long overdue recognition. Her devotion throughout the famine embodies the spirit of the community. For the pioneers, the worry of unpredictable weather was not over. At times it must have been almost impossible to persevere, and they used sheer strength and determination to carve a place of their own. They did stay and slowly prosper pragmatically moving farm buildings further from the river to avoid the spring thaw. Year after year they struggled on. Can you put yourself in the place of the first Franco-American settlers of the St. John River Valley? We have all lived through Maine winters, haven't we? This year (1995) has been unusually mild. Just imagine, scientists can now tell us that the pioneers of those days were living through a "little ice age", which gripped Canada and the northern United States. Remember, in 1816, it snowed in July! Written by Angela Clegg, re-printed from "Discover Maine's Aroostook County, with permission from the Madawaska Historical Society. In the 1790's there were about 30 families in Madawaska. Besides cultivation of the soil, the industries of the time were maple sugar, fur commerce, and exportation by water of lumber which was in demand for the construction of the English ships. Already the colony was exporting grain, having more than it could consume. But, the severe trial that nearly always comes to new colonies, was to bring famine. Two years of floods and September frosts destroyed nearly all the crops, so that 1797 became known as the year of "la grande disette", or "la misère noire"...the great of the great famine. After the last frost of 1796, the rest of the crop was snowed under by one of the hardest winters known. Many colonists left for Fredericton or went up the St. Lawrence for the winter. Those who stayed lived exclusively on wild meat and herbs. At the end of a particularly long period of waiting and anguish when the men were gone (hunting) and snow had fallen for eight days without stopping, all food was gone...the last of the boiled meat, the last cow slaughtered and eaten. It was during those long days of hunger and anxiety that Marguerite "Tante Blanche" Thibodeau, wife of Joseph CYR, accomplished her wonders of heroism and charity. She was the angel protector of the weak, the infirm and sick, and proved to be a saving strength of the miserable colonists. On snowshoes, with a load of clothing and provisions that she would do without or that she had collected, she went from door to door distributing a ray of hope. Laying out the dead, snatching from the grave those who were surely doomed without her help, she gave her care and lifted the morale of those who had given in to their misfortune. At last, one night the men returned with the body of one who had died of privation and cold, and another dying, but also with a little food. The colony was saved. "Tante Blanche", as she was known, when all her charitable works were revealed, became the object of general veneration. She cured the sick, chased out evil spirits, found lost objects, reconciled enemies, and brought good luck just by wishing it. She softened the most hardened souls, reformed the blasphemers, and brought conniving cheaters to live exemplary lives in the most tender piety. Even hopeless drunkards were more afraid of the world of admonition or the menace of her fist, than of a bishop! More than one mustache was wet with tears when she was lowered in her quasi-royal grave. She was the real aunt of a great number of young families in Madawaska; Leblanc on her mother's side, she was the granddaughter of Rene Leblanc the notary of Grand-Pré mentioned in "Evangeline". She died in 1810, and was exposed in the church of St. Basile, a privilege never before accorded, and to very few since. Re-printed excerpt from the "Madawaska Centennial" booklet, with permission from the Madawaska Historical Society.